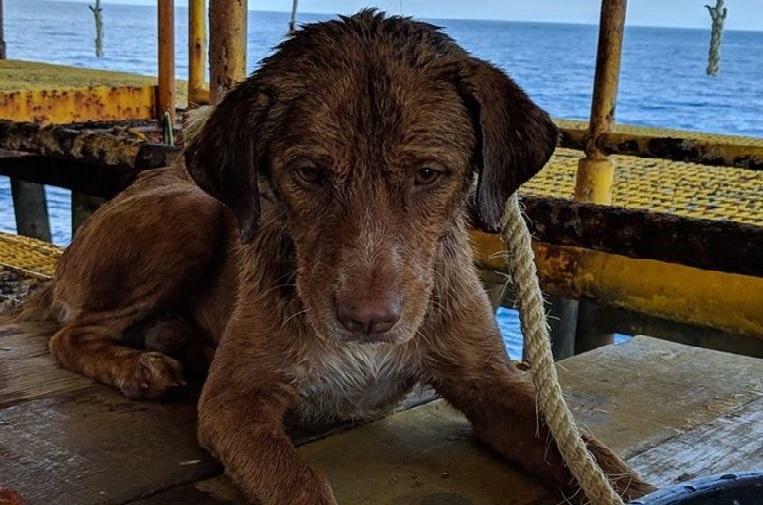 ©Facebook/Vitisak Payalaw - The dog is lying on the drilling platform exhausted and dehydrated. A brave dog probably swam about 220 kilometers in the Gulf of Thailand before it could be rescued by drilling platform workers. Last Friday, platform staff saw the dog’s head rise above the waves as it swam through the sea. “The weather was calm and so did the water. If the waves had been slightly larger, we would not have been able to see the dog,” wrote Vitisak Payalaw, one of the men that rescued the dog, on the Facebook platform. The dog climbed on the large metal pipes of the drilling platform. “He was very calm and did not bark or growl,” writes Payalaw. “We tried to save the dog and lifted it onto the platform with a rope around its body.” The dog was exhausted from his long swim and had lost a lot of moisture. He was given water and food and soon recovered. He spent two nights on the drilling platform before being put on an oil tanker that set him ashore in southern Thailand. The dog was checked by the vet and turned out to be completely healthy. It is not clear exactly where the dog came from and whether he really swam the whole part. “The dog may have fallen or jumped from a fishing boat,” Payalaw thinks. The team on the drilling platform is believed to be heroic. After the story was shared on Facebook, Payalaw was offered donations to support the dog, but he has indicated that he will not accept donations. One of the employees of the platform has already indicated that he would like to adopt the dog if it turns out that the brown four-legged friend has no owner.